When BikeWalkCV started advocating for more safety and accessibility for people walking and biking in Castro Valley, the biggest hurdle we identified was funding. Alameda County Public Works Agency (PWA) created extensive plans for many sidewalks in Castro Valley, but has very limited funding to carry them out anytime soon. The funding source for the current set of proposals is California’s Active Transportation Program (ATP). ATP will fund projects that can show the highest probability of increasing the amount of students walking and biking to school, as well as increasing the safety of those students. We were able to show that building continuous sidewalks on these heavily used routes to school will result in exactly that. Castro Valley’s projects will compete first state wide for $180 million and then with other SF Bay Area projects for approximately $30 million in regional ATP funding. (Here is the full list of projects submitted to the MTC for regional funding.) The seven grant proposals are primarily seeking design funding – the first step in any sidewalk project. Although building sidewalks is a multi-year project, getting this initial funding will start the clock. Our grant-writing team helped with multiple stages of the grant proposal process: coordinating school/parent surveys, researching health and demographic statistics, photographing dangerous areas for pedestrians, and conducting extensive public outreach. Perhaps you heard from us at a PTA, MAC, or Town Hall meeting this spring or completed a survey through your school? All of this community-wide effort culminated in a marathon writing process, resulting in seven 200-page grant proposals headed to reviewers on June 1st. We look forward to hearing some good news come September and have high hopes for the outcome of this hard work for Castro Valley. In the meantime, thanks to all who contributed! Agreed! So many streets not on that list above need sidewalks. This particular grant process focused on streets around schools — James Ave is near several schools, but is not a key arterial for pedestrian traffic. For smaller, residential streets, we need to find other sources of funding. In an ideal world, we could successfully advocate for Alameda County Public Works to increase the amount of money allocated to sidewalks in their budget. Until then, residents have to rely on the Alameda County Sidewalk Construction program (which reimburses residents $750 of sidewalk construction costs at their residence), or combine with their neighborhood to create an Extended Services County Service Area. It is very dangerous walking to and from school on Edwards Lane. There are no sidewalks, cars park on dirt or black topped areas in front of houses, and traffic going to and from Creekside create problems. Walkers are forced to walk in the street with traffic coming each way. We need sidewalks or tickets for parking where we should be walking. Someday there will be a child or an adult hurt. In the short term, you can request parking enforcement by calling the Alameda County Sheriff’s Eden Township Substation. 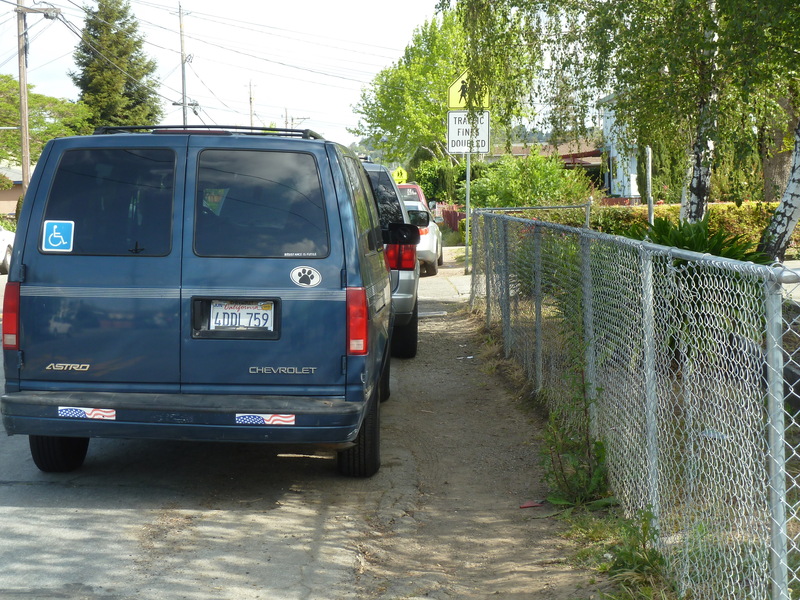 It is not legal to park on the pedestrian right-of-way, even if there is not a real sidewalk there. We are working with the Alameda County Sheriff’s Department to put together fliers educating the public on how (not) to park along the unimproved sidewalks.